President Donald Trump said in a pre-Super Bowl interview that aired Sunday that "a lot of people" in the NFL have thanked him for the recent passage of criminal justice overhaul legislation. 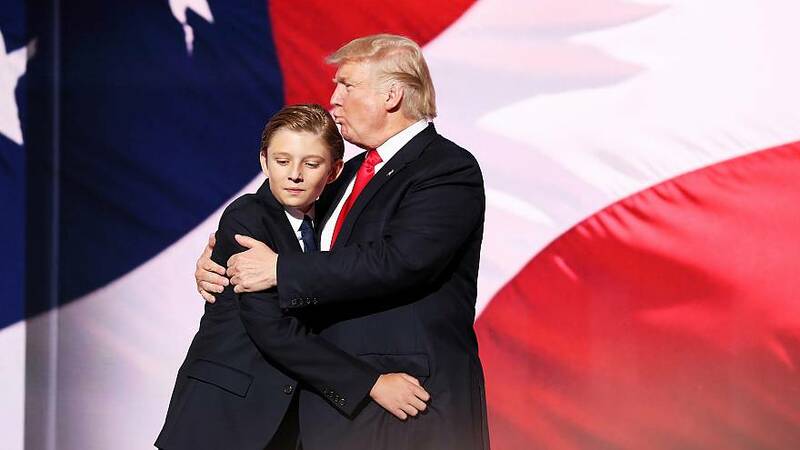 The president, who as a candidate blasted the NFL for becoming "soft," also said in the interview with CBS News that he would not steer his youngest son Barron toward playing football because of how dangerous the sport is. Trump said NFL players "haven't been kneeling and they have been respecting the flag and their ratings have been terrific ever since" he signed the legislation, which makes sweeping changes to the federal criminal justice system, particularly for non-violent drug offenders. The controversy over NFL players protesting during the national anthem began in in 2016 when former San Francisco 49ers quarterback Colin Kaepernick began taking a knee during renditions of anthem before games to spotlight police brutality and the mistreatment of black Americans in the criminal justice system. Kaepernick has remained unsigned since opting out of his contract at the end of that season. The protests caught on with other players — and caught the attention of prominent politicians, including Trump, who said at a September 2017 rally in Alabama that it would be nice if owners said of players who kneel, "Get that son of a b---- off the field right now. Out." In the months that followed, Trump seized on the issue, repeatedly railing against players on social media and at rallies and firing up his base. Asked by "Face the Nation's" Margaret Brennan if he thought the players who took a knee had a point, Trump said, "Well, you know, I'm the one that had passed judicial reform." "And if you look at what I did, criminal judicial reform, and what I've done — President Obama tried. They all tried. Everybody wanted to do it," Trump said. "And I got it done, and I've been, you know, really — a lot of people in the NFL have been calling and thanking me for it." Trump signed the bipartisan legislation, which the NFL endorsed, into law in December. "They have been calling and thanking, you know, that people have been trying to get that taken care of, and it's now signed into law and affects tremendous numbers of people, and very good people," Trump said. "I think that when you want to protest, I think that's great. But I don't think you do it at the sake of our flag, at the sake of our national anthem. Absolutely." The president added that he did understand the motivation for the players' protest. "A lot of it is having to do with reform, from what I understand," he said. "Whether it's criminal justice or whatever, it may be, and they have different versions and everybody seemed to have a different version of it. But a lot of it had to do with that, and I took care of that." "I think that people have to, at all times, respect our flag and at all times respect our ... national anthem and our country," he continued. "And I think there are plenty of places and times you can protest and you can do a lot. But you can't do that. That's my opinion." Brennan then asked Trump if he would allow his youngest son to play football. "It's very, it's very tough question," Trump said. "It's a very good question. If he wanted to? Yes. Would I steer him that way? No, I wouldn't." Trump added that he doesn't "like the reports that I see coming out having to do with football." "I mean, it's a dangerous sport, and I think ... it's really tough. I thought the equipment would get better, and it has," Trump said. "The helmets have gotten far better, but it hasn't solved the problem. So, you know I — I hate to say it because I love to watch football. I think the NFL is a great product. But I really think that as far as my son — well, I've heard NFL players saying they wouldn't let their sons play football. So it's not totally unique, but I — I would have a hard time with it."